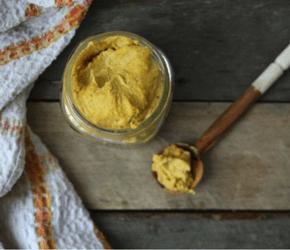 Here’s a fall twist on homemade coconut butter. This high fibre treat is the perfect addition to toast, waffles, can be mixed in pancakes, ice cream or even coffee for a homemade healthy pumpkin spice latte! Add shredded coconut to a high powered blender or food processor. Blend on high for about one minute if using a blender. If using a food processor, scrape down the sides and continue blending until a paste has formed. Add in the pumpkin and spice and mix to combine.